On Dec. 16, 131 veterans and other anti-war activists were arrested in front of the White House after refusing orders from the police to disburse. Along with hundreds of supporters, veterans of Iraq, Afghanistan, Vietnam, Korea, WWII and more marched solemnly from a rally in Lafayette Park to the fence immediately in front of the White House. Once they reached the police barricade that had been erected, the veterans lined themselves along the White House fence, refusing to leave. In this act of civil disobedience, veterans of a wide range of U.S. wars demanded an immediate end to the occupations of Afghanistan and Iraq, drone attacks and proxy wars around the globe. On the day that President Obama reported the findings of the intelligence assessment of the war in Afghanistan, which promised heavy combat and increasing casualties for years to come, those who have seen the Pentagon’s wars firsthand disrupted business as usual and occupied the President’s front lawn until each of them were dragged off in handcuffs. This dramatic act of civil resistance consisted mainly of veterans, who were joined by other community leaders and supporters. Those arrested included Brian Becker, National Coordinator of the ANSWER Coalition, along with Mike Prysner and Ryan Endicott, both Iraq war veterans and March Forward! organizers. 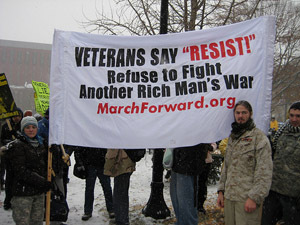 The action was organized by Veterans for Peace, March Forward!, ANSWER Coalition, and many more.